Description: Water is essential to life on Earth. We use it every day for drinking, cooking, cleaning, irrigating, and much more. And while it is such an important part of our lives, we are facing mounting issues when it comes to droughts, flooding, and the systems and infrastructure by which we receive our water. This course covers local and global water supply and demand issues, our current water infrastructure systems and where they are failing, and new technologies and innovations that are helping create more sustainable water solutions for the future. Presented by: Brigitte Dillman-Cruce, Kohler Co. 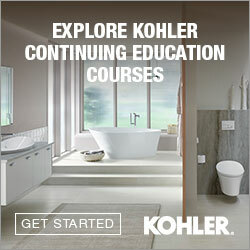 Title: Curriculum Manager-Sustainability, Kohler Co.
Brigitte Dillman-Cruce is Curriculum Manager for Sustainability at Kohler Co., focusing on Sustainability, Design & Development, and Innovation programs. She has experience managing technical training, leadership and professional development, internship and mentoring/advocacy programs. Brigitte is a member of the Kohler Sustainability Core Team and Kohler Environmental Leadership Team (KELT), and Design for Environment Core Team. She is a member of ATD, AIA, and is certified by CPP in MBTI and FIRO-B, and certified in the FourSight assessment tool. Her education includes a BA in Art History and MA in Art History and Museum Education from the University of Washington. This CEU is registered with the Interior Design Continuing Education Council (IDCEC) for continuing education credits. This credit will be accepted by the American Society of Interior Designers (ASID), International Interior Designers Association (IIDA) and Interior Designers of Canada (IDC). The content included is not deemed or construed to be an approval or endorsement by IDCEC of any material or construction or any method or manner of handling, using, distributing or dealing in any material or product. Questions related to specific materials, methods and services should be directed to the instructor or provider. This program is registered for 0.1 CEU (continuing education credit). LSBID approved course. Members self-report their credit to the Louisiana State Board of Interior Designers. NKBA members must self-report CEUs to NKBA. Contact your respective governmental licensing and regulatory agency. You need to be logged in to download the course materials for Water Supply, Infrastructure & Conservation. If you need to create an account, you can do that here.